1. Box Jellyfish Stings Hurt: Though they pack a less potent punch than box jellies in other parts of the world, Hawaii’s three species of Box Jellyfish can still deliver a painful and serious sting. Their tentacles, like their relative the Portuguese man-o’-war, are lined with stinging cells used to capture prey. Each cell fires a toxin-dosed barb that can penetrate the skin, which causes the singing sensation. 2. You Can Treat a Box Jellyfish Sting: If you DO get stung by a Box Jellyfish, there are things you can do to mitigate the pain. If you are stung, experts recommend rinsing the area with salt water before pouring vinegar on the sting to deactivate any of the remaining toxin—pouring freshwater or putting sand on the cells may only irritate live cells and cause inactivated barbs to dig in. Lifeguards posted on many Hawaii beaches will have vinegar or a similar remedy onhand. Avoid touching the area before being treated, the cells can be transferred and all parts of the jellyfish, including the bell, can potentially sting. Remove any tentacles or jellyfish parts with a stick other object. Ice packs usually help reduce inflammation following a vinegar treatment. It may take about an hour for the stinging sensation to subside, and there may be a retained mark on the skin. If you have been stung and experience a more severe reaction such as difficulty breathing, problems with vision, cramps or palpitations seek emergency medical treatment immediately. Box Jellyfish aren't the only jellyfish in the waters surrounding Hawaii. You may find other species, such as this one, when you're swimming. 3.You Can Avoid Box Jellyfish By Timing Your Beach Visit Right: Of course, the best way to avoid box jellyfish stings is to stay out of the water when warnings are posted (keep in mind, jellyfish are present in Hawaii’s waters year-round, there is no guarantee of avoiding an encounter altogether). But, you can predict when they’ll appear by learning about their mating habits. Box jellyfish reproduce under certain lunar and tidal conditions. They will mate beyond the reefs at night a few days after the full moon, but appear inshore after nighttime high tides recede, leaving them trapped along the beach. Beachgoers can expect influxes of jellyfish on Oahu’s south facing beaches about eight to ten days following the full moon. To view a Box Jellyfish calendar, click here. 4. Some Beaches May Be Closed When a High Influx of Box Jellyfish Appears: Back in February of this year (on Friday the 13th, to be exact), officials closed Hanauma Bay because of an unusually large influx of Box Jellyfish in the bay. According to ocean safety officials, at least 80 people were stung, and more than 100 were counted, forcing them to close the popular visitor destination for the day. They promptly reopened the bay the next day. 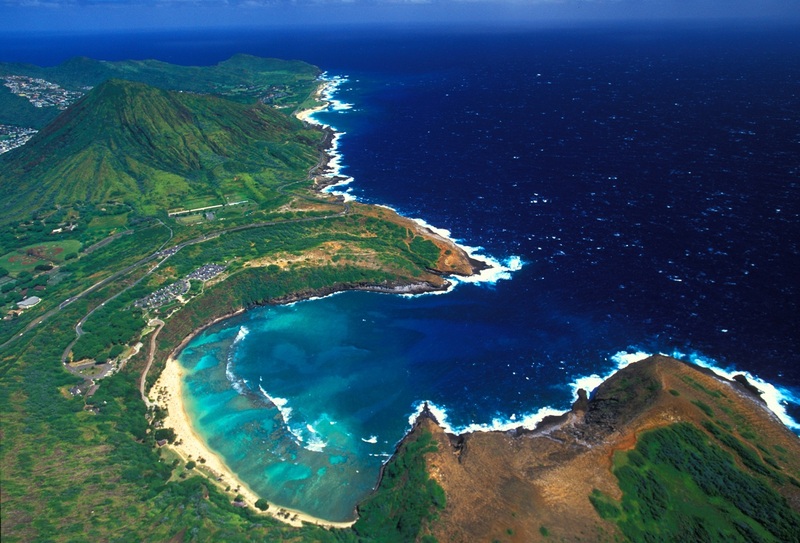 In February, officials closed Hanauma Bay due to an unusually-large Box Jellyfish influx. So, if you’re planning to visit Oahu and swim near the beaches on the island’s South Shore, mind your timing and keep a spray bottle of vinegar handy. You never know when Box Jellyfish may decide to invade the waters near you!